The Man In Terracotta Attire. Reporting from Bus 314, Stockport to Offerton. I walk onto the bus and flash my bus pass to the bus driver. He nods his head in agreement. I stride two steps along the corridor, searching for a seat to sit. There, to my right I see an empty pair of seats. I shove in one of the seats, and my body finds comfort on leaning against one of the windows. Slowly I open the zip of my handbag and pulls out a novel. I give a pat on the cover of the book. I lean forwards, and my other hand brings the book closer to my nose. It smells good like a fresh apple. “Um,” I said, and nod my head. Like I am holding a new baby, I open the book with care, and leaf through the pages until it takes me to the last page I have read earlier. I quickly turn around and I see scores of people, and they tend to bewitched on something, and at this point I failed to understand what could it be? I follow their eyes and there my eyes settles on the man, who is sitting in the front, on the very seats that are predominantly reserved for the elderly people, and the mothers carrying their babies in perambulators. The man has a pink bald head, with a few hairs that are two inches long, which remains uncut just below the center of his head. His hairstyle reminds me of a desert, that after walking a thousand of miles, then, you see a green plant in the middle of a dry land. On his face I notice a dry- wet green chalk mark that starts from his forehead and creating a distinguishable V mark on his nose. His terracotta trousers show unique folds of shapes like that of baby napkins, when mothers wrap around their babies. His top is a short sleeved and with a round neck, it also reveals how physically packed is the man, as it tightly shapes up his body, revealing a lot of muscles. A string of two-folds tiny wooden beads formed his necklace. I notice a pair of brown sandals on his feet. The man in terracotta attire is having an endless conversation as he murmur some words. No one hears the words that he mutters, but this form of conversation is drawing a lot of attention. As people want to know who is he? What he does? Where he comes from? A chance to explain himself and elaborate more on what he is doing? Every eye on the bus is like big brother cameras, observing, and recording every minute detail, and concludes with a real true life story. The man is immensely in worship. When I look at him again, I noticed that his terracotta attire complements with his pink tanned face. I hear little frickles of laughter behind my back, and I turn around to find the source, there I look into the eyes of two young ladies in their late teens, and their countenance reveals that they are also intrigued by the terracotta man’s behaviour. The two girls mumble in each other’s ear. I smile and switches back to the center of attraction. All along the bus has been steadily moving and only the bus driver misses the exciting film about the terracotta man. Whilst in the middle of these observations, the terracotta man stands up, and it feels he senses something. He picks up his bag and moves away, his feet find the passageway and heads straight at the back of the bus. But he finds an empty seat in the middle, and decides to sit there. It’s a disappointment for me. I have just begun scribbling a few notes about him when he manoeuvres away. In the middle it feels like a big task for me to turn around and observe him and without attracting his attention. I decide to read my book. Then, suddenly, I hear voices in the back, I swiftly turn my head and sees the terracotta man is a having a normal conversation with another woman sitting directly opposite to his seat. The woman holds a leaflet in her hand, which the terracotta man has just given to her. It also attracts the attention of other passengers, there is a demand of his leaflets, and I take my chances to ask one for myself. Politely he bows down, and he hands over to me one of his leaflets. I quickly sieve through the message written in the leaflet, and quietly I grasp one important word, and the word is Hare Krishna. It reminds me of a shop named Hare Krishna, in Marondera town, in Zimbabwe. Every time I have entered the shop, I have heard the Hare Krishna song being played; it became known as a perpetual song that every customer would get to know about it. Never had I have the zeal to ask the workers nor the employer why the song has been continuously played day in and day out. What’s the message behind it? The Hare Krishna song was sung in a foreign language unfamiliar to my mother language, Shona. But today I am anxious to know about Hare Krishna, and the message still lies in my hand. I look back at the terracotta man, and I see him foraging in his terracotta bag, and releases out more of the leaflets. He smiles and bows down as he distributes the leaflets to every passenger sitting on the bus. I thought of it, and I say, well his strategy has worked in his favour. Just look unfamiliar, do things that are unique, mostly and importantly be yourself. Now the message about Hare Krishna flows in every hand, and ready to spread, and I am spreading in my own way, writing and describing the events that I have just captured on the bus on my way home. The leaflet in my hand, I look at the title that reads: The truth shall set you free. Actions and Reaction/Karma is the subtitle. I quote the first paragraph of the leaflet that reads. “In this world of birth and death we are all warriors caught up in the struggle of life, where every single action produces a reaction that binds us to Us to the cycle of Re-birth. Like depositing money in the bank so that we can spend it later. GOOD DEEDs help us to enjoy in the life or the next if we perform enough good Karma or actions in one lifetime or the next birth on…) Bad action of karma will result in hell. On the back of the leaflet is a bold face of a picture of a human, in white and in black. Half of the face and the eye is simply clear while the other half is covered in fur. Beneath the picture there is a message boldly written. “At the time of death, the consciousness created by the living being carries it to its next body. If the living being has made its consciousness like an animal’s it is sure to get the animal’s body.” The source of the information quoted. I go to church and I don’t believe in the last statement that after death our spirits will enter the consciousness-desired body and then get an animal’s body. I believe that the spirit will have a rest. I believe that there is judgment day and for every one of us shall face it, and God questions accordingly on how you performed while on earth. Every creation believes that there is God, but how to get God has been a journey of circles as people have perceived their own way, which they think is it’s ultimately right, if a stranger tried to divert from their beliefs, may face resistance, isolation and persecution. If they believed, some will be sceptical, but if you dissect that message thoroughly well, you will have an overwhelming support. It will spread from one region to another like Christian gospels and other religions. I look at the terracotta man, as he stands up, his feet finding a way out. “Thank you sir,” I interpose, “ would you consider yourself to become a Christian?” He smiles, and shakes his head, in disagreement. He exits from the bus. “It was quite an exhibition,” I heard a voice from the crowd, followed by a thunderous laughter. I noticed the address of his building of worship that it is within the close parameters of our local church, in Whaley Range. On the leaflet, there is an invitation note to join the International Society for Krishna Consciousness Manchester, on every Friday and Sunday for an Evening of Music, Chanting, Dancing, and Free Freshly cooked Vegetarian foods. Discover the secrets of happiness through yoga and extra. The only conclusion, I come up with was that, I once heard someone preaching and said, If you don’t worship God, there is something you worship, it could be idols, or anything that takes most of your time. To us God gave us a spirit of worship. In conclusion, it has been worth going out, and the natural observation has enabled me to write a beautiful story of the terracotta man, and able to bringing in different genre of interesting issues that incorporate with our daily lives. Next time if you see a terracotta man, say hi on my behalf, and he may be holding something new which can excite you and able to share with others as I have just done. In my Shona language there is a common proverb that says: Chitsva chiri murutsoka ( something new is on the way). “They are racist”… a patient shouted out. I love writing and in writing I can express myself better. I felt I should write this story as to draw attention to what some people face in some parts of the world. Some of the stories that I write are alien to other people as they wonder whether the writer wrote a true story or a fictional story. I also remembered when I grew up in Zimbabwe, I read some books, which had some intriguing stories that happened in my neighbouring country, Republic of South Africa; I wondered whether these stories were real or not. The authors were both white and black who highlighted of apartheid, the segregation that went between people of different races, the hierarchy of the colour bar, the torture, the poverty and how thousand of millions of Africans people suffered in their own motherland when the rich, bully, minority ruled over them. The majority died a brutality death, some people were maimed, some were separated from their beloved ones for a long period as injustice took over in their lives and spent three decades in prison, and a good example is of Nelson Mandela, who faced all the criteria of harsh treatment in his life time. When I moved into Britain, my daily life encountered different challenges, and some incidents begun to bring some ringing bells of the books that I read in the past of some racist incidents, or remarks. There was nothing of illusion of the incidents that I faced, and I realised this was the reality I was living in and the reality of situations that some authors had highlighted and I wondered whether they were true? One day, in 2006, in Rochdale, I was walking in one of the residential estates and I met a young white boy of five years. The moment he saw he screamed to me and said, “I hate you because you are black.” I was shocked and I never answered him back. I never blamed the child but I thought he might have picked this racist language from the streets or from unruly parents. Britain is now a country of multicultural diversity. Within this beautiful Island it faces it’s own challenges and some of the challenges are highlighted with my relevant topic. My friend works in one of the biggest NHS hospitals in Manchester as a nurse. On the other night while she was on duty, a male black patient called out: “They are racist, I want a black nurse to look after me.” He continuously called out and insisted he wanted a black nurse. In the end she was forced to go and attend that patient and offered him with his medical needs but her service to the black male patient was short lived as the nurse in charge decided to send an Asian nurse to attend his needs throughout the night. “They are racist,” it’s an inclusive expression term but does it mean all whites are racist? My answer is NO. It is prejudice and stereotyping. There are many millions of white people who are good at heart and it is a few who mess up with other people’s lives hence brandishing a good name. At some stage of my life I lived with a white family, professionals, but very humble to earth and helped me in many things that I needed and until today we are still in good books. I have witnessed some white communities where they have helped people who become homeless from people of ethnic minorities, offering them with their own accommodation at their own expense. Some white communities campaigning against harsh treatment that asylum seekers face in this country. Raising the awareness of the disadvantaged minorities. When Zimbabwe was in crisis, some of white people came for night vigils that were held weekly at the Zimbabwe embassy in London. In a similar environment where my friend works she also highlighted a similar incident that happened between a black nurse and a white patient. A black nurse attended the needs of the white patient. She offered her with support to lift her up, but soon after the white patient complained of her body being itchy and matters were reported to the seniors. In the end white nurses who happened to take her to the bathroom where she was thoroughly washed, also attended to her medical needs. In an environment like this one would think a patient should welcome any help s(he) is given without bringing any division between the workers which I believe their ethos of the service are the same. Surprisingly these incidences come up unexpectedly hence bringing tension with the organisation. Regardless of this, the medical officers are required to respect the patient’s wishes but in some circumstances it is not always the issue as the black patient was to face the Asian nurse, not the black he called for. I have been motivated to write this article because of the latest racial abuse incident that took place in Serbia where the local fans chanted abusive racist words towards the black players who were playing at international under English team. Danny Rose, the England defender was racially abused and pelted with stones in the Serbian city of Krusevac at a football match, played on Tuesday the 16th of October 2012. It prompted the English government to call for tough sanctions against Serbia. It is harsh and cruel to torment other people because of their colour skin. I believe people who are racist are ignorant and if they were wise they would understand God uses variation in his creation. In everything He created He saw it good. I understand from bible that God created one race, which is the human race. It’s the rotten human mind that degrades other people and thinks they are not fit for purpose, yet when we are one and united together we can perform wonders. One man who lived in Chegutu, Zimbabwe, he heard people talking of family planning and they emphasised on child spacing. He thought deeply about it and he realised since he had been married he had six children born one year after another. He still wanted a big family and he enjoyed his role as a father. One morning he woke up and told his wife that he was travelling to Bulawayo to see one of his best mates who he had not seen for ages. The wife battled with the idea and tried to dissuade her husband not to travel and this was going to be their first separation since they have been married for six years. “Baba, baba” the wife cried bitterly as she held tightly her husband, “please don’t go, I love you and I won’t be able to copy up with the children alone,” she said as she blew her nose on her old white handkerchief. “No, no. I can’t stay here,” the husband said as he pulled his wife’s hands away and transfixed his huge eyes on his wife. “This journey is for your favour, darling. Since we have been married you are breeding children like mice. I don’t like that and I want to give you some rest,” the husband spoke with reassuring tone. I will travel to Bulawayo to do some child spacing. “If it is for some child spacing baba, I will let you go but just remember to write back. She affectionately kissed her husband and bade farewell. The husband left for Bulawayo. After nine months gone, the husband wrote his first letter to his wife in Chegutu. Upon receiving the letter, the wife danced with joy that her long gone husband had finally thought of her. With excitement burning in her she gathered all her six children around her and opened the letter so she could share the good news with the children. Carefully she pulled out the letter from the white envelope and smiled as her eyes lay upon her husband’s writing for the first time. The wife began to read loudly: Dear first lady. Firstly, I would like to apologise that I have taken so long to write to you, darling. I hope this letter will find you well and our children. Secondly, this for you and our children, I would like to inform you that my journey for child spacing was successful as ever, here in Bulawayo. I am grateful to announce that a newly born bouncing baby boy has been added to our family. I am writing while the baby rest peacefully in his mother’s lap whilst my other hand strokes the head of my second beautiful African queen. It was when she finished reading the wife realised what she had read. She tore the letter and cried bitterly. “To hell with child spacing,” she cursed and promising herself never wants to see this cheating man. The Baboons reared a baby. Once upon a time during the liberation struggle of Zimbabwe, a certain village in Manyika Province was bombed by Smith regime soldiers. The whole village was turned to ashes. All the people in the village died but there was only one fortunate survivor, a baby girl. The baby cried throughout the day and night but no help came from the nearby villages. The following day a troop of baboons that were passing by saw the baby lying next to the burning ashes. Filled with compassion and having understood the plight of the baby, the mother baboon picked up the baby and carried on its back. The baboons moved back into the forest where they started to look after the little baby with tender loving care. It gave them pride and a purpose. The baboons provided food for the baby. At night-time the baboons would go and sleep in a cave. The mother baboon would grab the baby and brought it closer to its chest and cupped the baby with its fur arms to give the baby the best warmth. The father baboon would sandwich the baby, providing the best protection and warmth. As the days flew by, the little girl developed quickly and mastered the baboon life, eating like a baboon, walking like a baboon and communicating like a baboon. All these development pleased the new parents especially the mother baboon who made all the efforts to fend her and teaching all the tricks of surviving in the jungle. The little girl could quickly alert the baboon family if human beings were coming to send them away from their fields and orchards. Two years later the little baby girl was now capable of walking long distances in search of food. She used her hands as forefront legs like the baboons. It was on one of these trips that the little girl was noticed with other villagers whilst walking with baboons. The people in the neighbouring villages were puzzled. Some people who were more curious than others started to follow these baboons and observe from a distance and discovered the truth that the little girl was part of the baboon’s family. It is from their observations that they noted that the little girl was living happily with the baboons and there was a kind of mutual understanding. The little girl was also protected from any outside attacks especially from the human beings. 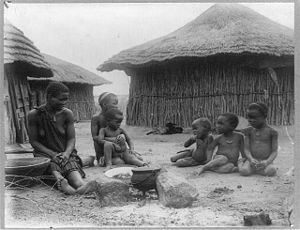 The story was reported to the Chief of the area and who finalised that the little girl should be taken away from the baboon’s family and brought her to the village. The villagers gathered and found a way to take the little girl from the baboon. When time came to pick her up, the villagers could not comprehend the fierce attack they faced from the wild animals. The baboons were screaming and chanting but it did not stop the villagers to go ahead with their plan. The baby girl became very upset when she realised her old family had been overpowered. The baboons ran after the human beings in attempt to grab their child back.